The end of WWII left Europe and the World divided along political lines: Communism and Capitalism. Exporting the Communist system from the USSR to many countries however, was not without conflicts. Between 1945 and June 1956, two uprisings (East Berlin, German Democratic Republic, June 1953 and Poznan, Polish People's Republic, June 1956) broke out, showing the disillusionment of people in the Communist system and the living conditions it provides. In October 1956, emboldened by the signs of Poznan, students and intellectuals in Budapest, the Hungarian capital, organize a protest of previously unseen magnitudes. As the Communist leadership sweeps in to kill the movement in its tracks, a violent response is provoked, thus sparking the Revolution of the 23rd of October. 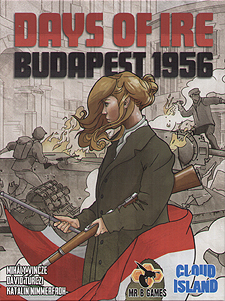 One player plays as the Soviet Forces, trying to hold the movement back, while a group of 1-3 players play against him as the revolutionaries, driving the movement forward through the seven days between the 23rd and the 29th of October 1956. Otherwise play co-operatively as a group of 1-4 revolutionaries against an AI Soviet force, with solo and co-operative modes included inside this box.